Flora Cinnamon has just landed her dream job as television presenter for a new holiday show, and needs to travel for two months. She sends her thirteen year old daughter Mollie, from their home in Dublin to the isolated Little Bird Island with a population of just 200 people, to stay with her great granny Ellen (‘Call me Nan. Everyone does’). The island was once the home of Red Moll, the famous Irish pirate queen whose ruined castle lies close to the Songbird Café, the island’s meeting place. Nan’s house, Summer Cottage, is modern and beautiful, not the run-down shack that Mollie imagined. She is introduced to the girls in her class. But they see her as a city girl; stuck up, with fancy ideas, and someone to be excluded from their group. They are nasty and vindictive towards her, especially the leader of the group, Lauren. She’s a liar in whose mouth butter wouldn’t melt in the presence of others, but aside shows her true colours. Mollie finds herself in trouble due to Lauren’s fabrications and Nan decides to home-school her. A new man in Flora’s life makes her more muddle-headed than usual, and Mollie is temporarily marginalised. Determined to fill her time, Mollie helps Alanna, the young owner of the Songbird Café. She begins a tentative friendship with Lauren’s twin brother Landy, who is nothing like his sister, and is definitely not fooled by her false personality. 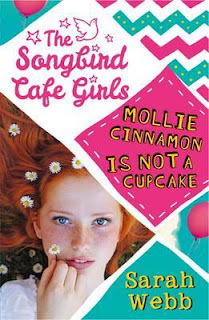 Mollie also finds that her family has kept many secrets. She begins to hear of things that have been left unspoken for years that impact her life. The old Mollie sheds her skin. She finds herself becoming involved in the island’s problems when the Café is facing closure and Alanna can’t make her payments. There are strings left hanging to be picked up, for this delightful and highly enjoyable adventure continues in Book 2: Sunny Days and Moon Cakes. This fantastic novel has outstanding characters and themes such as the importance of family, finding a sense of belonging and identity, and the need of have somewhere to call home.